Planning your wedding for the first time is exciting! As exhilarating as the experience can be, you should also prepare yourself for the whirlwind of events that lay ahead. When it comes to how or where to start planning a wedding, just remember that you are planning your very own wedding. For most people, it’s a once in a lifetime experience. You’re not planning anyone else’s big day. So stay focused on your wishes as well as the wishes of your husband or wife-to-be to make your day special. Planning a wedding for the first time will probably lead to you becoming expert in all things related to weddings like florals, cake tasting, food, wine, and decor. Sourcing a template on how to plan a wedding is a good way to start. It will help keep you organized as more plans begin to unfold. You’ll also find that there are also a lot of resourceful wedding planning websites and apps to help with wedding planning. Successful wedding planning should start with a smart budget. It’s important to create a budget and stay within it. Don’t be tempted to take a DIY approach to cut costs. Sending family or friends wedding bouquet examples and DIY party favours may seem like a good way to save dollars, but unless someone is a professional, this is a mistake and could cost a lot of money at the last minute. With wedding planning, you may find that quality wedding bouquets can get costly. Instead, think about the style of bouquet that you would like and seek out inspirational ideas for wedding bouquets online or in magazines. Visual examples will help you create the perfect floral design for you. The same approach can be applied when considering wedding venues and ideas for unique wedding decor. Saturating yourself inspirational wedding ideas will inspire your creativity and will increase the chances of your first-time wedding planning being a success. If the visual aspect of your wedding planning is elusive, create a vision board. Use Pinterest or Instagram to upload your favourite first-time wedding planning ideas and get a sense of your visual style. Include wedding bouquet examples, wedding venue examples, wedding ideas and dress styles in your albums. You might even want to upload visuals on how to plan a wedding to help other brides-to-be! 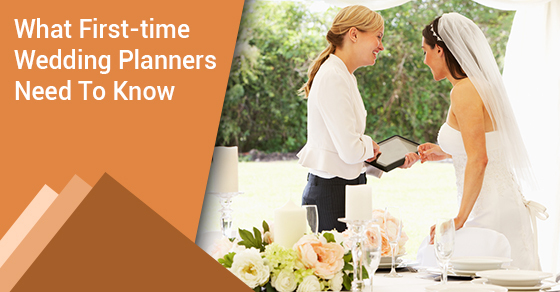 It’s important to be organized with your wedding planning, especially if it’s your first time planning a big event. On the other hand, feel pressured into making big purchases. With wedding venue examples and wedding bouquet examples, vendors may say they will be overbooked. Resist the pressure to make an impulse purchase. Be sure you’ve considered all your options and are happy with your decisions before purchasing. When it comes to how to plan a wedding, it’s a balance of inspiration and being true to yourself. Master this and your first-time wedding planning will go without a hitch.